Out of the many reasons why I love LPs is that I can usually find numerous excellent albums that have never been released on CD, and usually they can be found for pretty cheap (some of my greatest finds include extremely rare LPs that I bought for a measly 99 cents-or less). And many of these albums I find which have never been pressed on CD come from CTI. CTI fans who got rid of their vinyl and turntables long ago and who therefore have no way to listen to many of the label’s long out of print recordings now have reason to rejoice. Sony Masterworks, in celebration of CTI’s 40th Anniversary, is reissuing some of the label’s classic albums, many of which have never been available on CD. The CDs are all remastered from the original two-track analog tapes and the discs come packaged in a gatefold soft paper sleeve, which replicates on a much smaller scale the look and feel of the original LP. One of the latest batches of reissues include Randy Weston’s Blue Moses, Joe Farrell’s Outback, and Airto’s Fingers, which are available on CD for the first time. 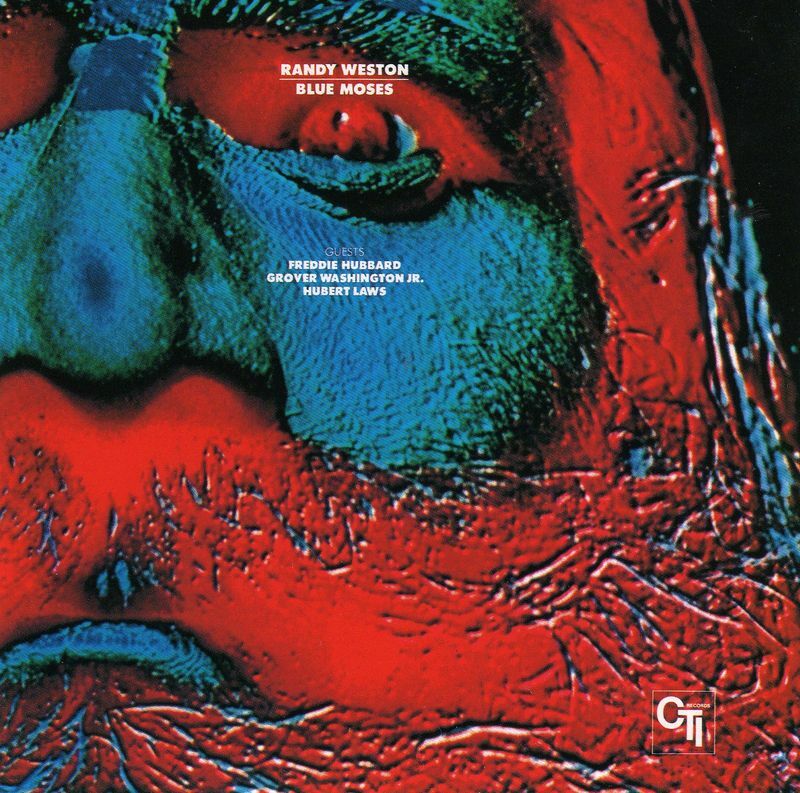 Randy Weston, Blue Moses – With arrangements by Don Sebesky, this is one of Weston’s most popular selling albums. Although I sometimes find Sebesky’s work to be a little too much on the commercial side for my taste, there’s no denying his arranging talents, and his arrangements here are excellent. Like many of CTI’s records, especially those arranged by Sebesky, there’s a pretty large ensemble. The core band of Weston, Freddie Hubbard, Billy Cobham, Ron Carter, and Grover Washington, Jr. is augmented by woodwind, trumpet, trombone and percussion sections. Weston’s compositions are all inspired by aspects of various Northern and Western African places and cultural practices. The disc opens with “Ifrane,” which was inspired by Weston’s visit to a ski village in the Atlas Mountains. Hubbard and Washington both blow inspired solos over the forward moving waltz. For “Ganawa (Blue Moses),” Weston used elements of a religious song of the Islamic brotherhood of the Ganawa, which exists throughout North Africa. The twelve minute piece grooves hard and is filled with brief, yet powerful horn section riffs and blasts. A third of the way in Hubbard blows over a medium swing. His melodic creativity and ability to shape a solo in a way that tells a story is on full display, and Weston’s comped figures play with time. Washington contributes another fine solo as well. “Night in Medina” is laid back, and Hubbard displays his more relaxed and introspective side. “Marrakesh Blues” closes the album, and features Madame Meddah’s vocals and an alto flute introduction by Hubert Laws. After a second intro by Weston on electric piano the piece goes into a waltz that’s punctuated with contrasting horn section lines before getting into the solo section. Weston’s solo is fairly understated, but things begin to boil when Washington comes in, as Sebesky adds rousing backgrounds. Blue Moses shows the musical manifestations of Weston’s Pan-African aesthetic and philosophy. It also strikes a nice balance between the core combo and a larger ensemble, in that the compositions and arrangements provide a great structure for some inspired soloing and add to but don’t overwhelm or get in the way of the music’s main focus. Blue Moses is well done all around and a great example of the best CTI has to offer. Joe Farrell, Outback – Joe Farrell, who I’m sure could have shredded any reed instrument presented to him, is a guy who deserves more attention and recognition (except for those sketchy disco-y records he recorded – unless you like that, then he’s good on those as well). If you haven’t checked him out on Andrew Hill’s Passing Ships, then you absolutely must. On Outback Farrell is joined by a killer band – Elvin Jones, Chick Corea, Buster Williams, and Airto. The title track is from the movie of the same name, and features Farrell’s overdubbed flutes at the beginning and a lengthy flute solo. Farrell’s flute and picc both sing. Corea is on electric keyboards throughout. Farrell’s “Sound Down” finds him in a decidedly Coltrane bag, as his soprano tone is very reminiscent of Trane, and upon hearing the opening waltz section one can’t help but think of “My Favorite Things.” The solo section is a straight up medium swinging 4/4, and Farrell shows off his complete command of the little horn (also check out his soprano solo on Corea’s “Bleeding Orchid”). Corea’s solo on “Sound Down” consists of primarily single note runs, which increasingly become juxtaposed and contrasted with left hand block chords. Jones takes a much less polyrhythmic approach compared to his work with Trane, and his playing is relatively understated throughout, although his work on the final track, “November 68th,” recalls Trane’s classic quartet.At 33 minutes in length, I would have liked one more track. Overall, Outback is a solid set by one of the more under-appreciated players in the ’60s and ’70s. If you’re unfamiliar with Farrell, Outback would be a good place to start. Airto, Fingers – Featuring Airto and his wife Flora Purim on vocals, Fingers is more of a rock/pop effort – as rocking the title track displays – than a jazz or fusion album. Guitarist David Amaro, keyboardist Hugo Fattoruso, bassist Ringo Thielman and drummer Jorge Fattoruso fill out the ensemble, and except for Amaro, each band member contributes vocals. “Romance of Death” by Hugo Fattoruso is a kind of fusion samba and features Amaro’s nimble guitar work and a wordless vocal solo. The mellow pop-influenced “Parana” is another vocal feature which is anchored by a steady and forward moving bass ostinato. “San Francisco River” has a spacey, psychedelic feel with reverb-laden vocals and electric keyboards. The album ends with the brisk “Tombo in 7/4” which features vocals doubled with guitar followed by group vocals. The track’s overall feel is celebratory, and it is should get your body moving. Fingers is a creative amalgam of several styles of American pop and rock, jazz fusion and Brazilian forms.